From surfers to restaurateurs, the opening of the Balboa Pizza Company is the fulfillment of a lifelong dream. "We named this place with fond memories of growing up on the Balboa Peninsula in Newport Beach, California" says Jeffrey, who along with Pete, David, Jonathan and Frank co-founded the Balboa Pizza Company. "It was after a long day of surfing that we got a little nostalgic and made a pact to never lose touch with each other. We vowed to someday open a restaurant with great food and drinks where we could hang out just like we used to in Balboa." 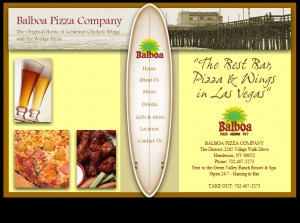 Although Balboa Pizza Company is far from the beach, the founders have done a great job recreating the Balboa beach lifestyle with awesome food and drink, cool surfer tunes and a laid-back beach atmosphere. "We've brought in everything but the sand!" notes Pete. Now the Henderson, NV restaurant is a lifelong dream realized. "Stop by and we can toast the sunset together and talk about the waves." adds David.